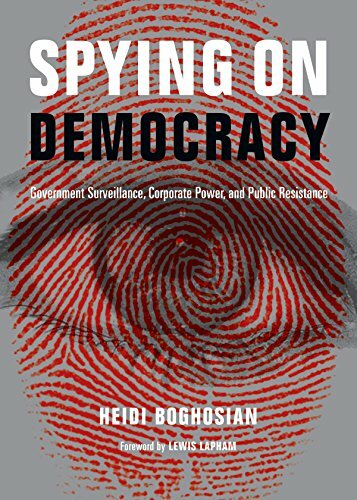 Heidi Boghosian’s Spying on Democracy: Government Surveillance, Corporate Power, and Public Resistance is a timely, controversial, and engaging account of government and corporate surveillance of daily life. The recent leaks by Edward Snowden regarding the National Security Agency’s (NSA) surveillance program (which apparently occurred too close to the publication date to be included in this volume, although Ms. Boghosian does discuss earlier NSA monitoring activity) makes this book highly relevant. Ms. Boghosian is forceful in her arguments throughout the book. While her passion for the subject matter is to be admired, the main problem with Spying on Democracy is that it reads more like an anti-government, anti-capitalist, and anti-technology manifesto than a serious, objective treatment of the important issue of how to protect privacy rights and civil liberties in an age of breathtaking advancements in technology and information gathering techniques. Ms. Boghosian fails, however, to acknowledge the potential value of closed circuit television (CCTV) cameras in both preventing and responding to terrorist attacks. For example, research is currently being conducted to determine if camera systems can identify an individual who may be hiding a bomb by the way he or she is walking. Had that technology been available and used at the Boston Marathon, then CCTV cameras might have been able to signal to the authorities that the Tsnarnaev brothers, rather than having running gear in their backpacks, were actually carrying bombs. Furthermore, it was video images, including those from individual cell phones, that helped the authorities identify Tamerlan and Dzhokhar Tsarnaev as the Boston bombers. It is also important to note that combating terrorism is a never-ending technological race. Technological advancements are there for all to take advantage of, including a wide range of extremists. The goal is to try to stay one step ahead of the terrorists, who can adapt to new security measures by changing their tactics or by using more sophisticated and lethal weapons. Terrorists today are technologically savvy and are also using the Internet to communicate with each other and advance their plans. That is why monitoring the Internet, without violating law-abiding individuals’ civil liberties, is an important tool in the fight against terrorism. Spying on Democracy would have been a more effective book and would have appealed to a wider audience if instead of pounding the reader with repetitive statements about the evils of big government, capitalism, and technology, Ms. Boghosian presented a more nuanced argument. Still, to her credit, she wrote a book that is relevant to the ongoing debate about how to protect civil liberties and privacy rights in the technological age that we all live in. It is an issue that is not likely to fade away anytime soon.